“What is truth?” Pilot asked Jesus (John 18:38). Ask a typical evangelical Christian this question and the likely answer will be “The Bible is truth”. What we generally mean when we say this is that we believe that the Bible is the source of truth. Consider for a moment, though, how Peter, Paul, or John would have answered that question. In terms of scriptures, all they had was what we call the Old Testament. Church leaders only finally recognised the collection of writings of the New Testament as ‘truth’ in the fourth century. In 367 AD bishop Athanasius listed the current twenty-seven books of the New Testament in his Easter letter. 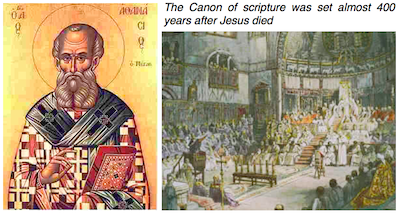 Later, the councils of Hippo in 393 and Carthage in 397 fixed the Canon of scripture, for the Western church. So then, what would the early Christians have regarded as their source of truth? The Lord Jesus was quite clear in His idea of truth. He said “I am the way and the truth and the life”. (John 14:6) It is ironical that when Pilate asked his question, the truth was actually staring him in the face!? Jesus often said “I tell you the truth” and His disciples recorded what He uttered. Yet, truth is more than what Jesus taught. You see, Jesus himself is the source of truth. This is a critical understanding. If we regard the Bible as the source of truth then we will expect to find truth only in the form of propositional statements. The Pharisees of Jesus’ day believed that the Old Testament scriptures were the source of truth yet Jesus said this to them; “You diligently study the Scriptures because you think that by them you possess eternal life. These are the Scriptures that testify about me, yet you refuse to come to me to have life.” (John 5:39-40) We tend to regard the Pharisees with patronising condescension yet we often make the same fundamental mistake they did. I believe in the inspiration of the Bible. I am convinced that it is the God-given documentary record of the truth. I am equally convinced that Jesus, himself is The Truth. Therefore, I come to the Bible not just to interpret its truth but also to find, in and through it, the one who is the truth, Jesus Christ the Lord. There are big differences in these two approaches to the Bible. On the one hand, we view the Bible through Christocentric spectacles. On the other hand, we view Jesus through biblical spectacles. Of course, the two concepts are intertwined. It is hard to ‘see’ Jesus without the aid of biblical spectacles. Equally, it is hard to know how to use biblical spectacles unless we focus on Jesus. The Bible is the God-given forum for encountering and learning about and from Jesus, and the Lord Jesus is the interpretive key to understanding the Bible. The great Protestant reformers did the church a great service by rescuing it from corruption, ignorance, and religiosity. In their zeal for truth, they brought the scriptures to the fore and made them accessible to all. However, they shifted the focus from personal truth to propositional truth and from experiential encounter to doctrinal understanding. I am not saying that this was their intention but it certainly seems to be the effect that they produced. 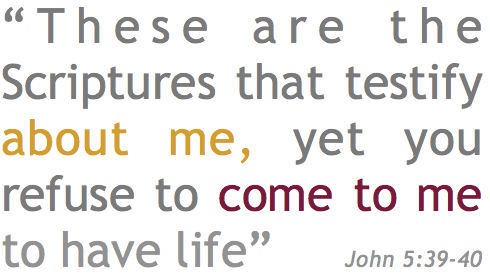 We need to recover the early church’s focus on encountering Jesus whilst holding fast to sound doctrine and practice. Most of us have been trained to think in ‘and/or’ terms. Either ‘this’ is right or ‘that’ is right. What is more, if ‘this’ is right then ‘that’ must be wrong. However, the Bible contains many conceptual contradictions and constantly challenges our commitment to and/or thinking. We need to learn to hold two concepts in dynamic tension. Jesus is truth. The Bible is truth. For me, the challenge is to comprehend the source of truth. 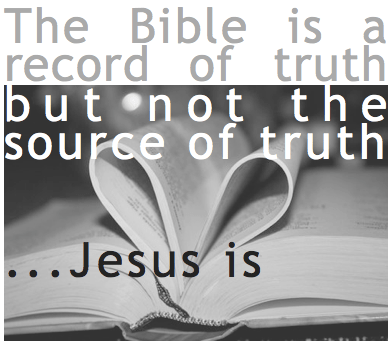 Jesus is the source and all other forms of truth are therefore derived. So, Pilot’s question should have been, “who is truth?” The answer is, “Jesus is the truth”. The Bible is the record of the truth, the documentary repository of truth, and the inscripturated Word of God. Jesus, in Himself, is the source of truth, the Word made flesh, the eternal Word of God. If we hold fast to this understanding then we will have little difficulty in interpreting the scriptures. What is more, Bible-study will be more than an academic exercise; it will be an encounter with the living Lord of the scriptures. This is a very meaningful article! I preached on Titus 2:1-10 yesterday morning as part of my SATS studies. A personal relationship with our Lord and Saviour, Jesus Christ is vital. He certainly is the source of truth and we need to apply the truth of the Bible to our daily lives in order to be spiritually healthy Christians. We are Christ’s ambassadors and must represent Him before people lost in sin. If we have unhealthy Christian conduct, it does not only affect our reputation, but more importantly it affects God’s reputation.